If you know us, this story is old news. But I feel like it’s an important one to write about, for those just joining us. There are about 5 houses in Franklin that we always have been in love with. It was going to take a LOT to tempt us away from Jackson Street, but when one of those five houses (which, was actually my favorite) came on the market, for a ridiculously low price, I wanted to go inside. Since we had just bought the Cottage next door, this didn’t seem like the wisest decision. I mean, Jackson Street had become our home. The bathrooms and kitchen were done to perfection, and we loved it. But something about the Victorian on Martin Place just kept at us. Maybe it was the fact that I kept looking at it online. 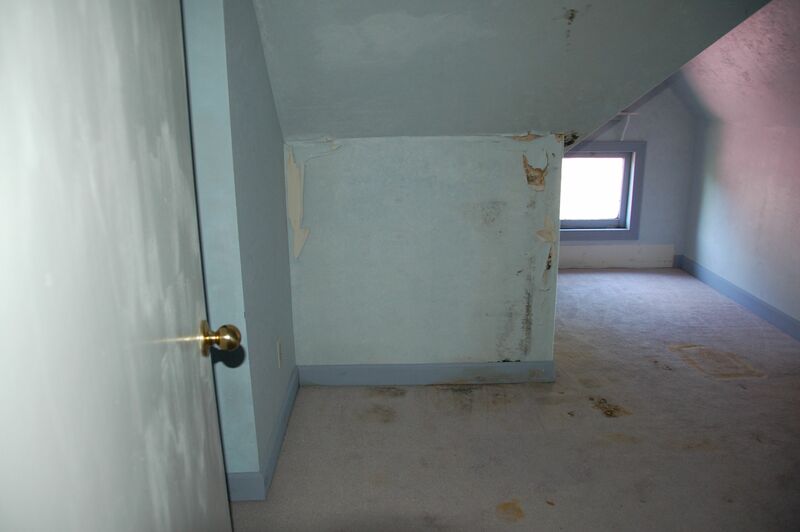 Maybe it was the grainy, dark, horrible realtor pictures that didn’t tell you ANYTHING about the inside – which I cheered on, because if there were GOOD pictures, someone was apt to buy it. I just really wanted to see it. Even if we didn’t buy it, I wanted to see it. Old, Prominent Houses are often named by who built them, or the most prominent person to live there, or both. This house is the Murray Bryant House, named after Henry Murray, a cattle farmer who built the house as his city home, and Roy C. Bryant, a prominent builder and lumber baron who served as Franklin’s Mayor from 1930-1936. I got my wish, after a 13-hour car ride of negotiations coming home from vacation. Let’s be honest though – Doug wasn’t a tough sell. Once I told him that the price was lower, and we went of the specs, he was on board to look, if not to buy. We actually stopped at a giant antique fair in Springfield, Ohio, on the way home. I pointed out furniture and chandeliers that would look AWESOME in our new house – you know, the one that we hadn’t stepped foot in. Doug is so accommodating to my crazy. Gutters and roof failing everywhere! Oh hey, there, slate roof. Thanks for jumping three stories to your death. Full on Monet. Ugh. This is in bad shape. 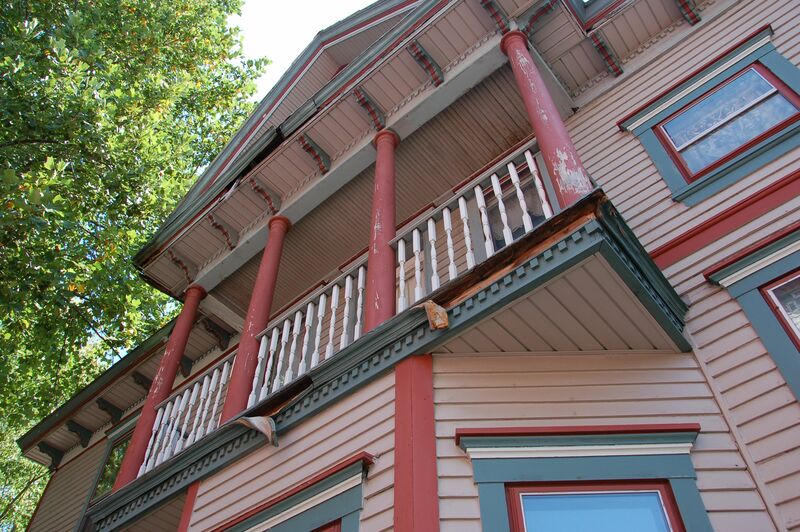 Balconies should not just peel off the house. But… THERE’S A BALCONY! 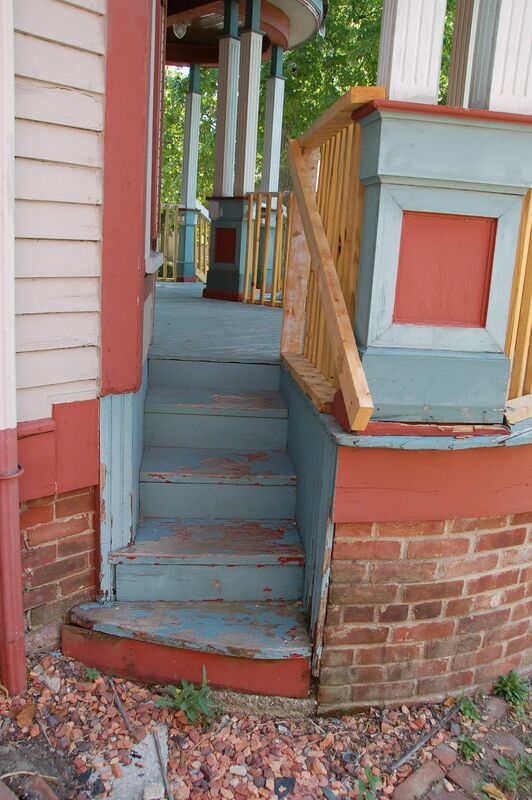 And there’s a secret side entrance to the porch. Super charming! There was woodwork and paint peeling off. There was more slate on the ground then on the roof. You could tell animals had moved into the holes on the exterior. It wasn’t pretty. Except…. that it was gorgeous. 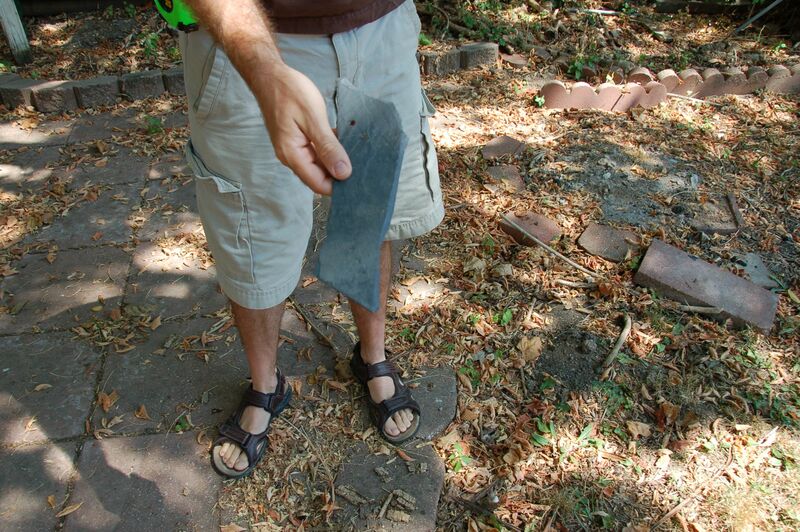 We went up on the porch, and I looked in the left front window, and while Doug was checking out damage on the porch. What I saw made me gasp. I was literally breathless and speechless. “Oh. My. God.” is generally what people say when they see this the first time. I couldn’t say anything. The Entry Hall was stunning. Out of this world, stunning. I have never seen a staircase like this. 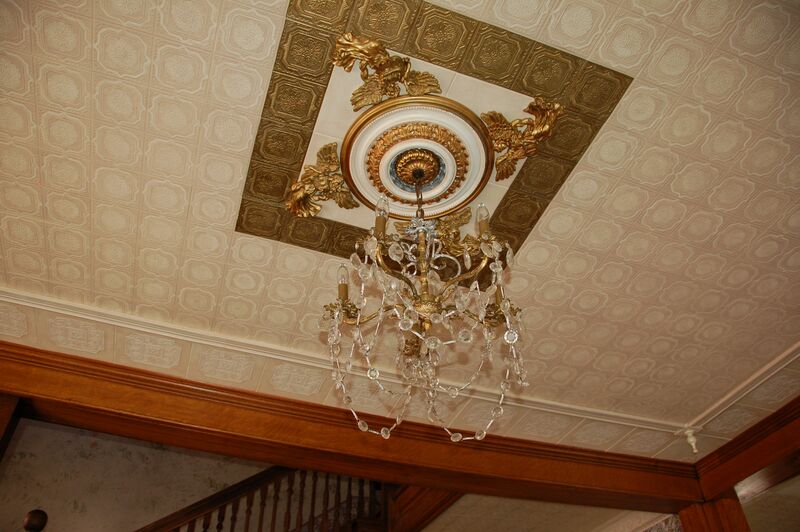 The ceilings, though not original, were a good reproduction. 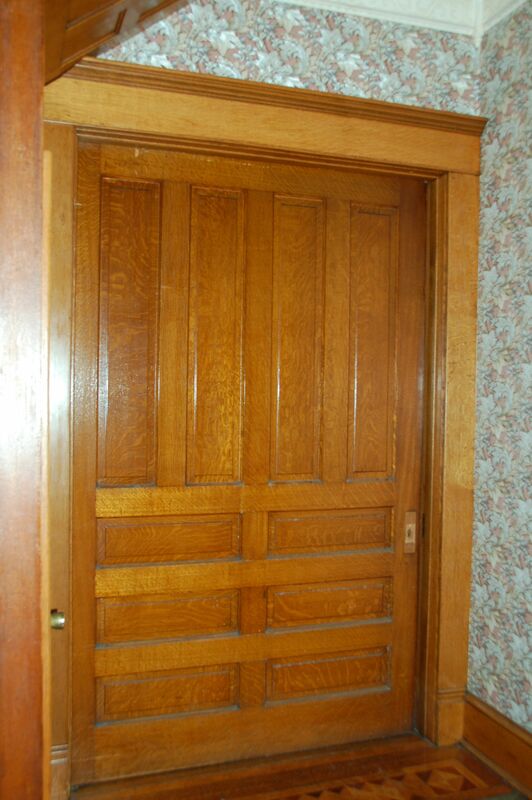 The is a pocket door that is about 6 feet wide – I’ve never seen a single pocket door in a residential house of this size. 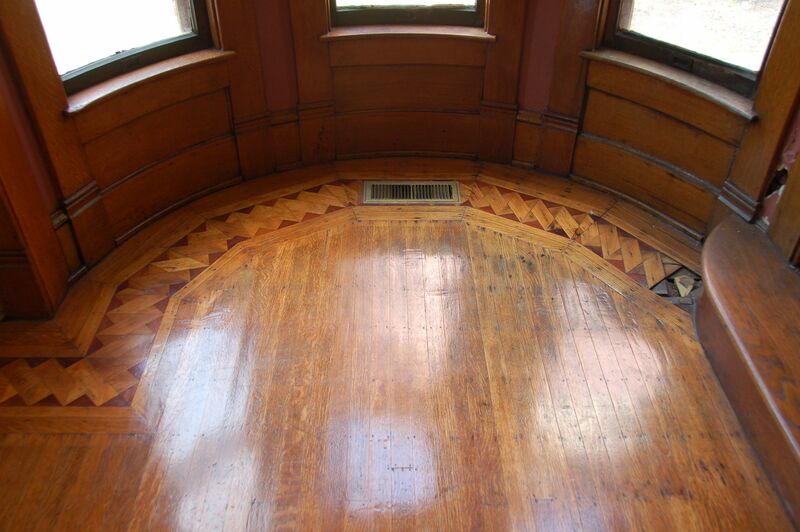 You could look past the décor to see the bones – the floors had an inlay that was stunning, if in need of repair. 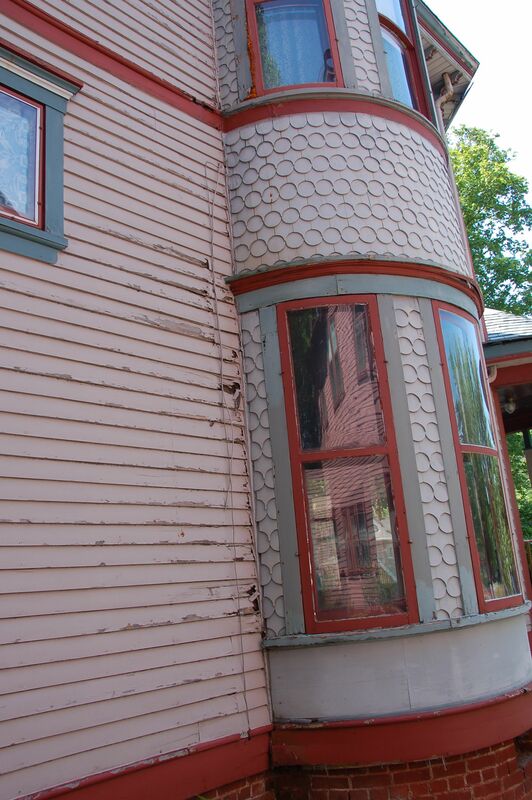 The interior turret, like much of the house, had sustained significant water damage with the absence of roof. All fixable. The entry hall is where we ask guests to start the popular party game “Count the Angels!” Can you find them here? There are SOOOO many more. 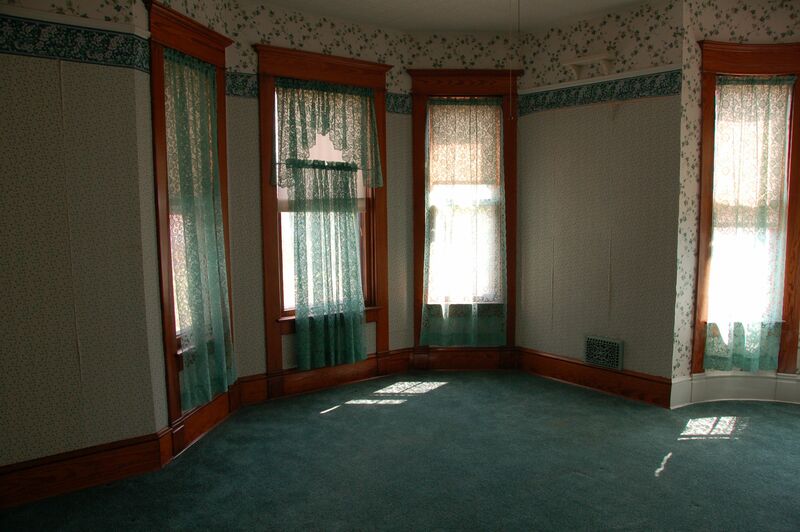 The Front Parlor had more ceiling and wall damage, but a lovely fireplace and horrendous carpet. 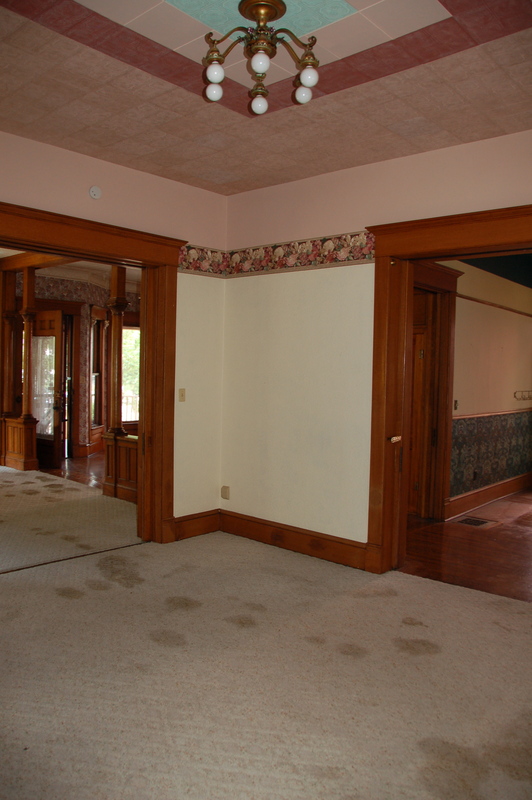 The entrance to this room had gorgeous white quarter sawn oak columns. 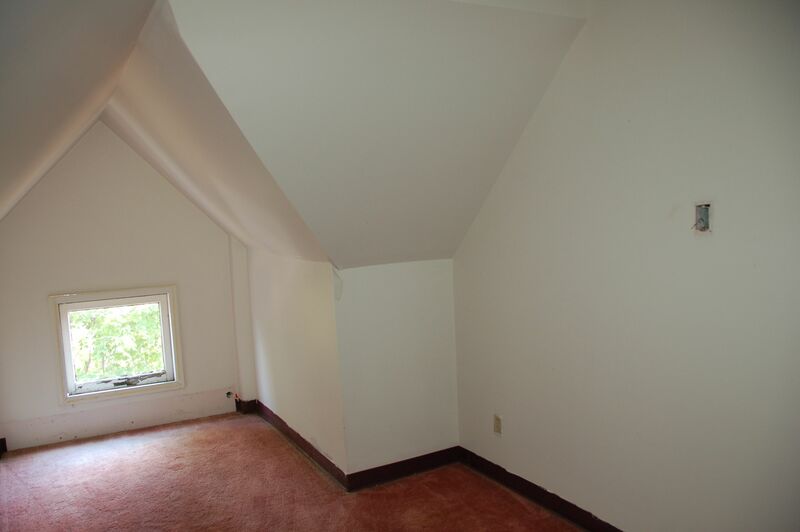 The downstairs has 11 foot ceilings. We had a dream that there would be more inlay under the carpet. Nope. Sad face. 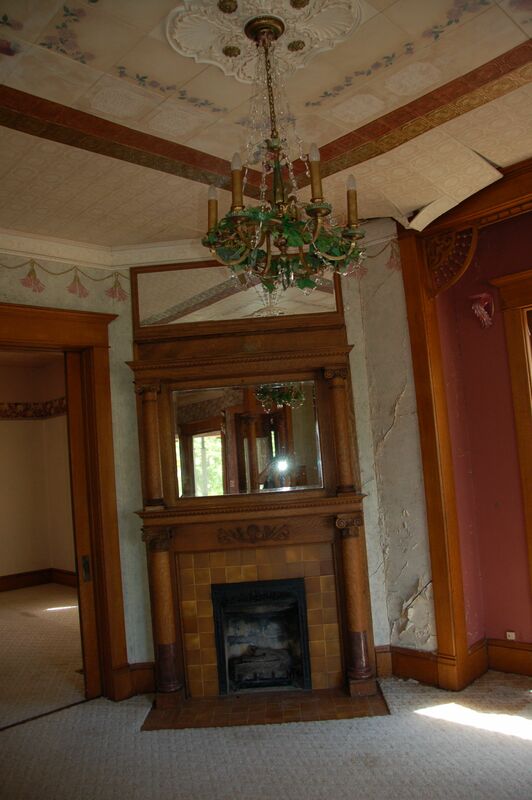 Let’s ignore the walls and ceiling falling down, and ESPECIALLY ignore the fake ivy on the chandelier. 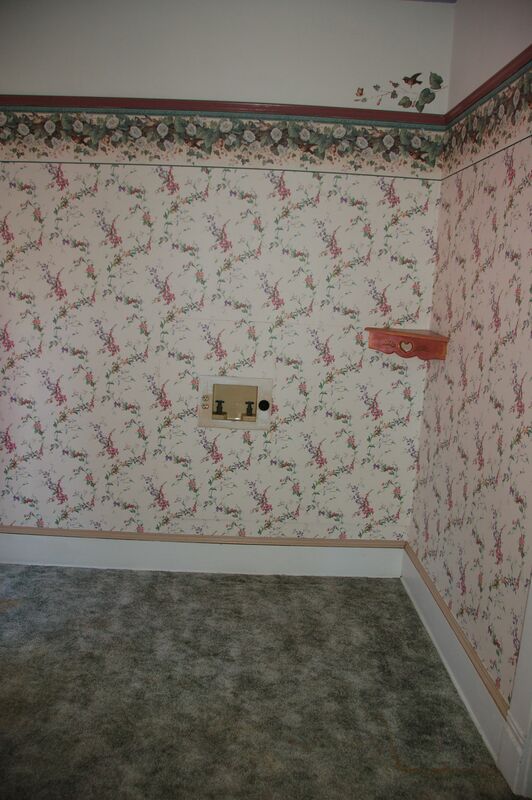 I’m not overly keen on the fireplace tile. 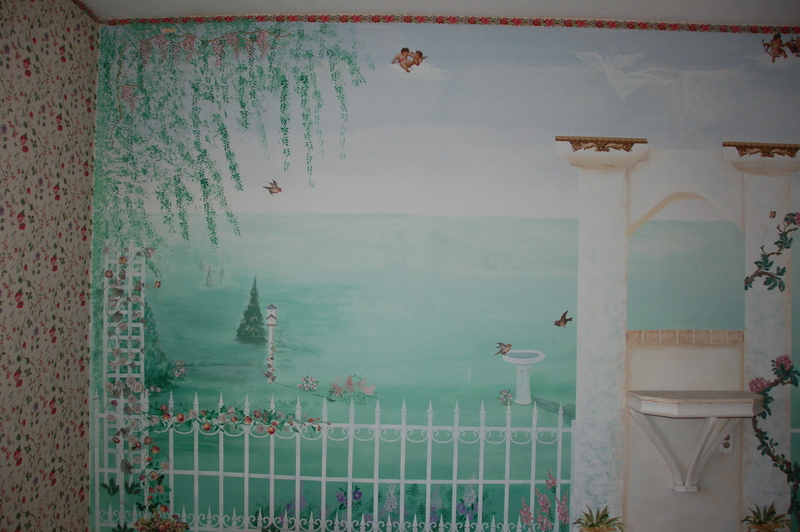 But it is quite a bit better than the stenciled on tassels on the top of the wall. 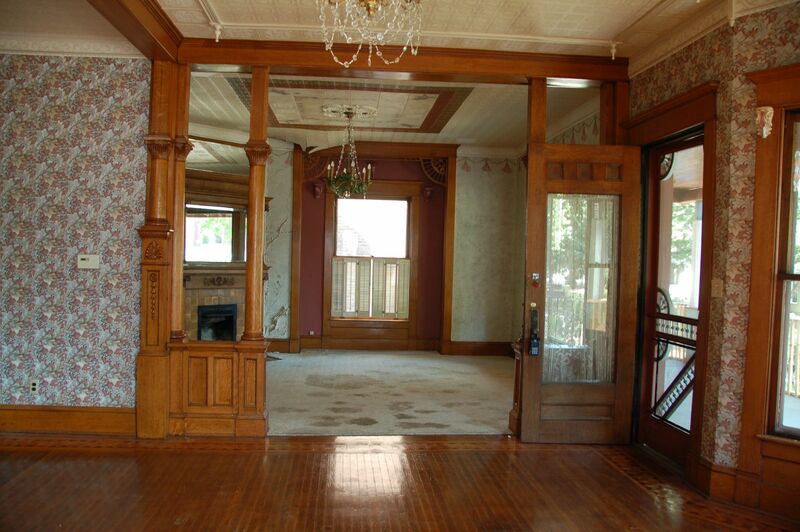 The second parlor (we’ll use it as the library) has wonderful features as well. For a house of this age, it is so open, due to the large sets of pocket doors, all in perfect shape (there are 3 sets, plus the large single door in the Entry Hall). Just like when we moved into the Jackson Street after the Franklin College baseball team, “Guess the Stain,” is a fun one. The carpet went first. This is my favorite light fixture in the house, BTW. The back Sitting Room (which will be Doug’s Study) had been converted into a bedroom, with a full bath and closet attached. I was in there about 5 minutes before I knew what I wanted to do with it. These striped wallpapers make me nauseous. The dining room has a gorgeous textured ceiling, a terrible chandelier from the 80’s I think, and beautiful lincrusta wall treatments. 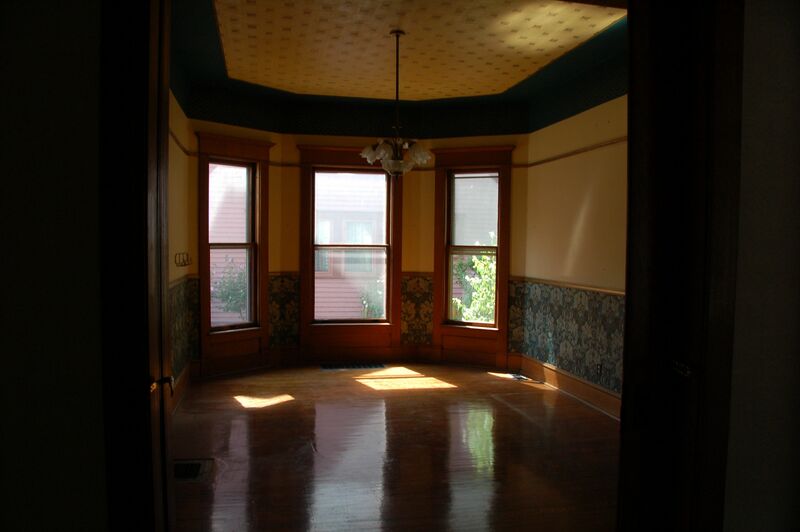 The floors are in great shape, with lovely light,. This is the room I love the most as is. As long as I ignore the light fixture. This won’t change a lot. Because I love it the most. But it will still feel totally different when I am done with it. The kitchen. This was hard, because we created such a showpiece at Jackson Street. 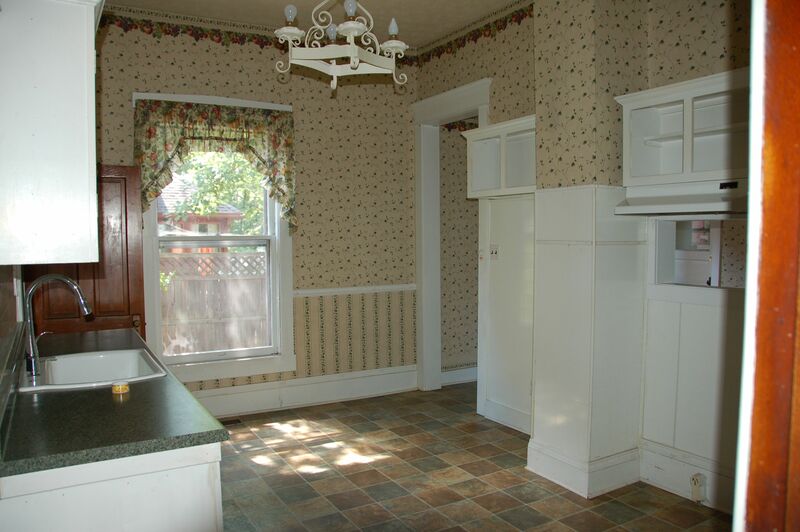 There was no counter space, it was laid out strangely, and the décor was awful. 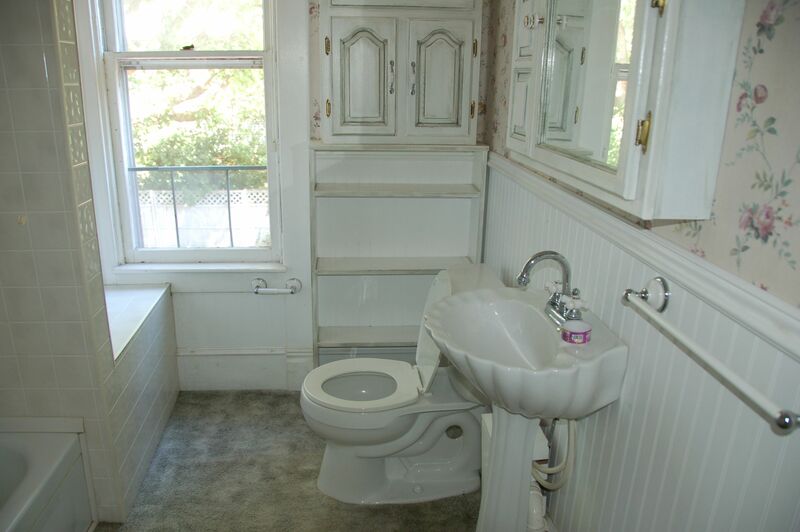 But with the 26×9 Breakfast “Nook,” there were possibilities. But it would be a complete gut and do over. This house wasn’t being nice on the checking account already. This was all the counter space. Such a small kitchen. No way we can entertain the way we do in here. This is the breakfast “nook.” Only one outlet, and a teeny tiny lonely sconce on the wall. I’d like to not talk about the curtains, if that’s OK. 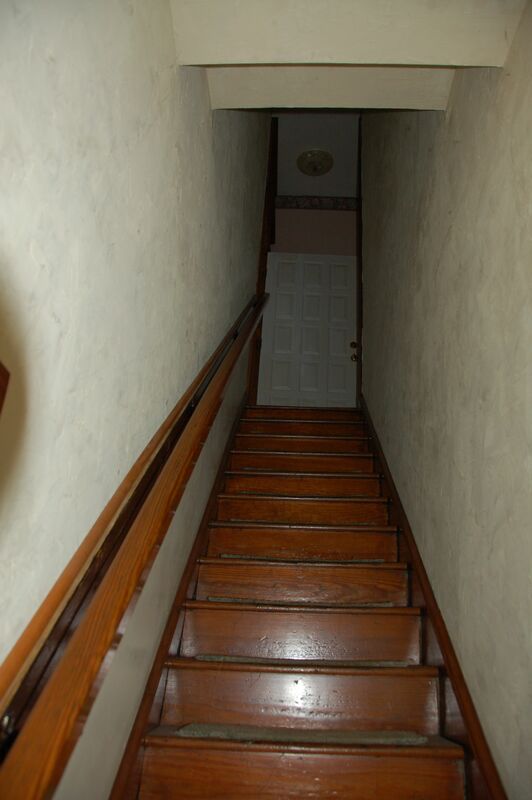 The Servant Stairwell is dark and steep and awkward. And AMAZING. 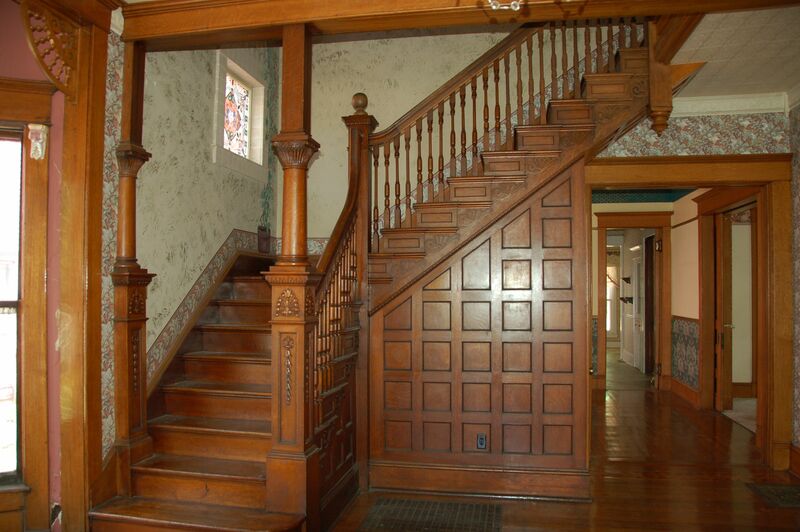 You can get to the upstairs from the front stairwell, or from the servants’ stairwell off the kitchen. 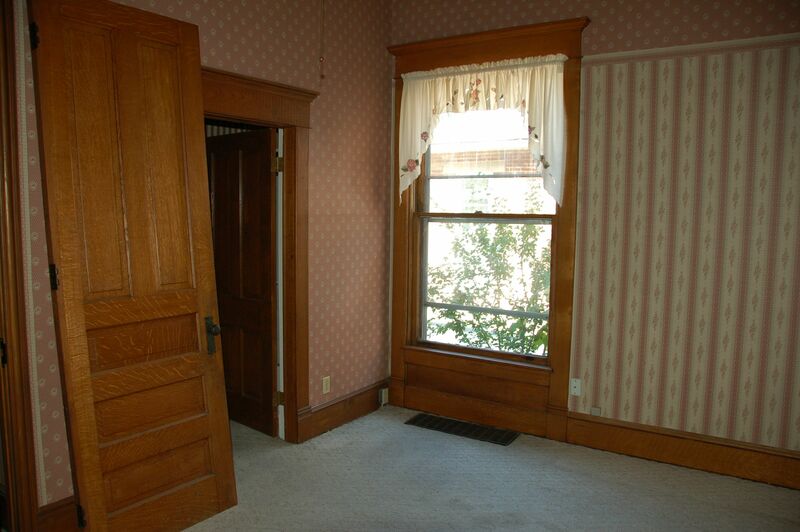 Upstairs, there are 4 chambers (bedrooms). 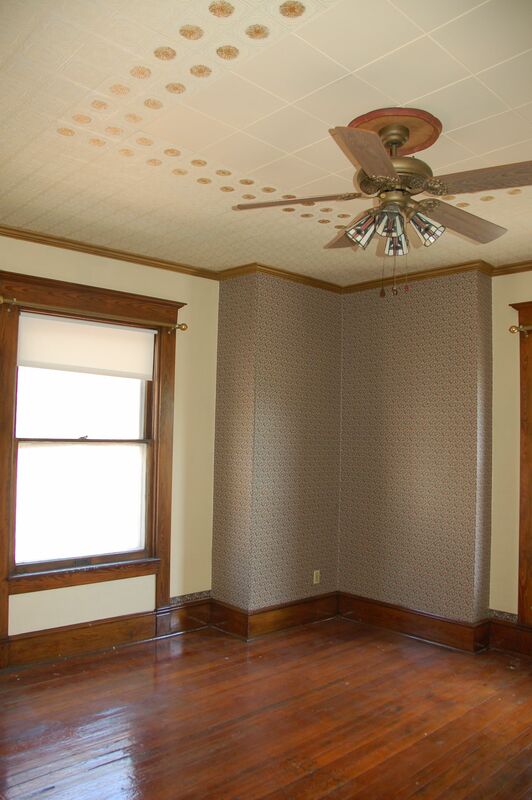 The front bedroom with the turret has great lines, amazing light, and blue-strawberry wallpaper. Not kidding. This will be a guest room. 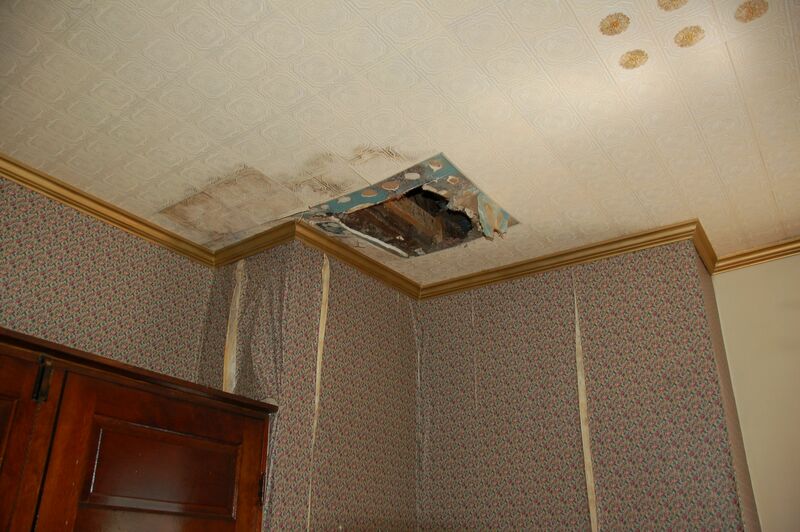 The second room, has significant ceiling and wall water damage. 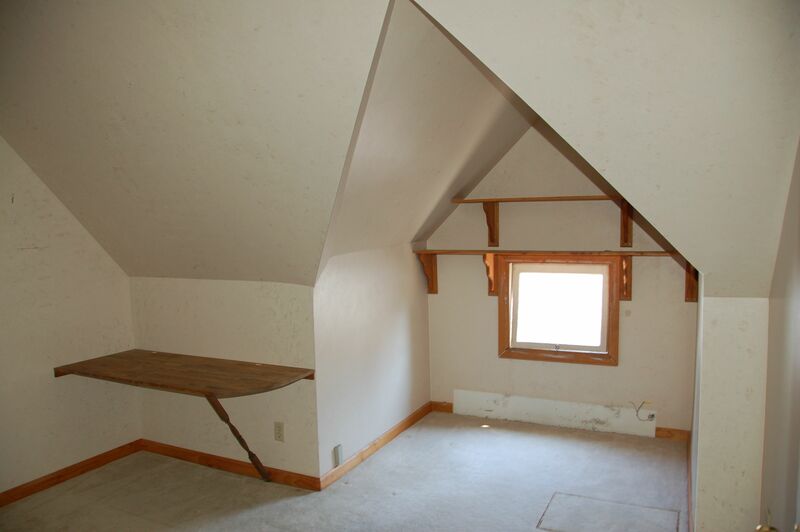 This will become my studio, sewing room, and office. The master bedroom used to be two bedrooms, so it is perfectly set up for a bedroom and dressing room. It’s HUGE. It’s also perfect set-up for Cinderella, or the cherub-infused photo shoot of your choice. “Count the Angels” goes off the deep end in here. Keep staring. You’ll find new surprises all the time. But really, this is an amazing set up for a master suite. My shoe collection will look awesome in here. 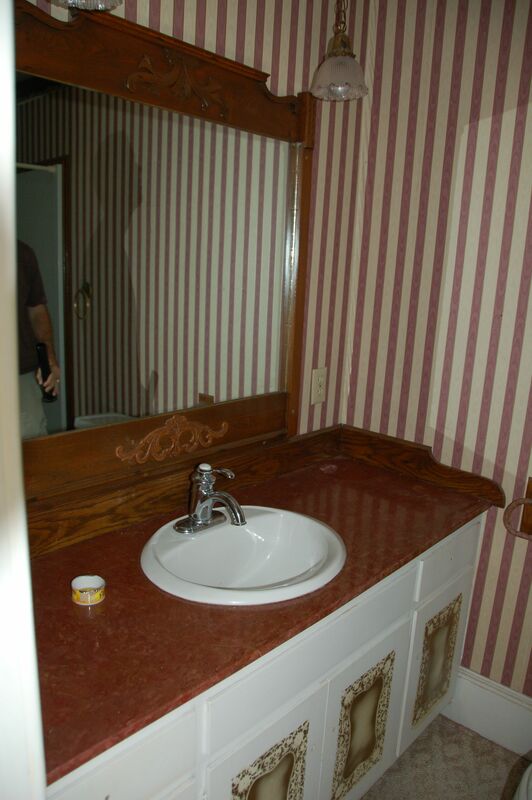 The master bathroom is small, dingy, has CARPET (for the love) and it has a horrible layout. 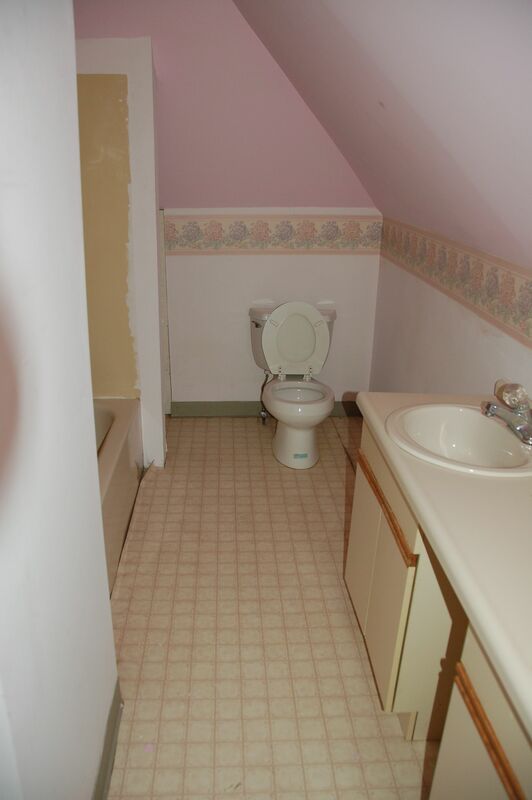 All 4 bathrooms are awful. But that was part of the appeal. I love designing bathrooms the most, and I love playing with the layout. I am so excited to steal some room from the bedroom and make it incredible. The space is there! The next bedroom has (wait for it) green shag carpet, washer and dryer hookups, birds escaping from the wallpaper, and a balcony. Guest room number 2! 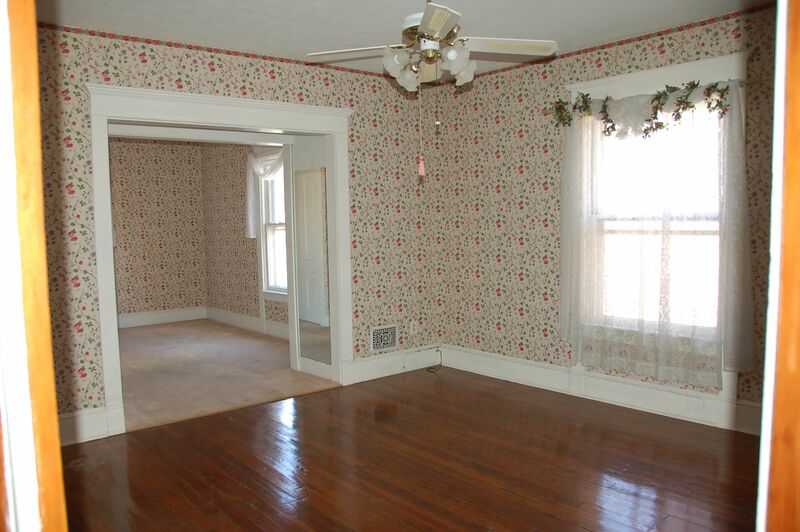 Off of this room is another horribly laid out bathroom. But with good light and bones. 10 foot ceiling up here! It’s like the birds coming out of the border are just trying to escape with all their might. I don’t blame them. At all. This has potential. I can’t wait to rip it all out and put in period appropriate pieces. 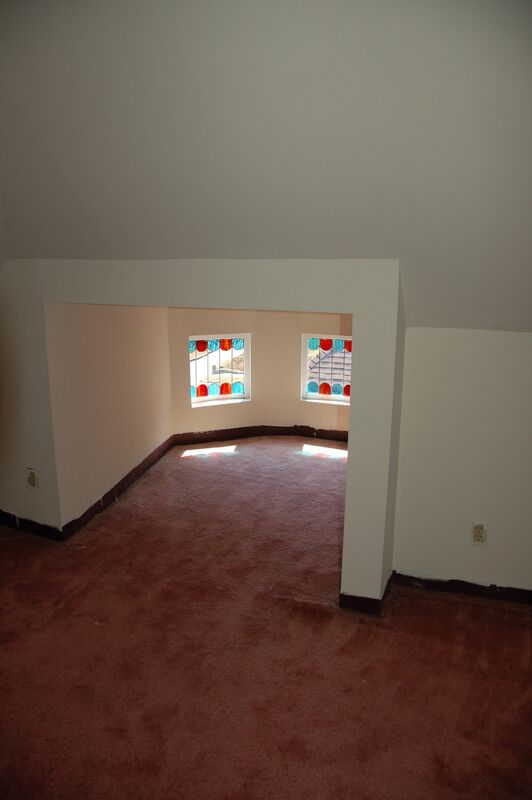 Also off this room is a stairwell to the third floor. 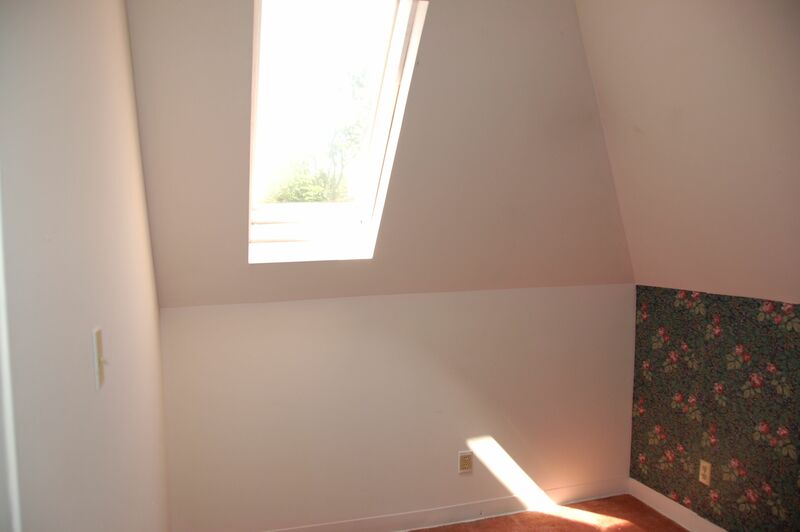 I hesitate saying attic, because there are 9-foot ceilings in the center of the room. 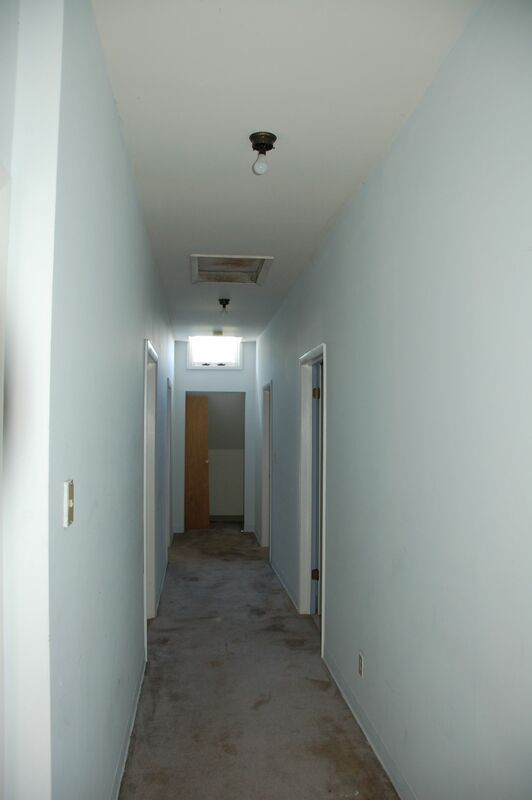 It looks like a dorm – five rooms off a long hallway, with great closet spaces, and a bathroom (horrible layout, have I said that already?). 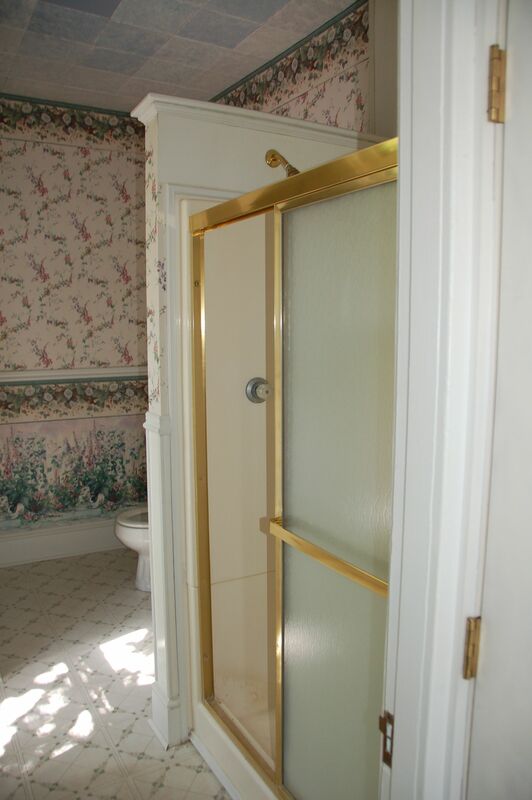 The bathroom come to us straight from 1985 (which, is actually the last time this house was renovated). 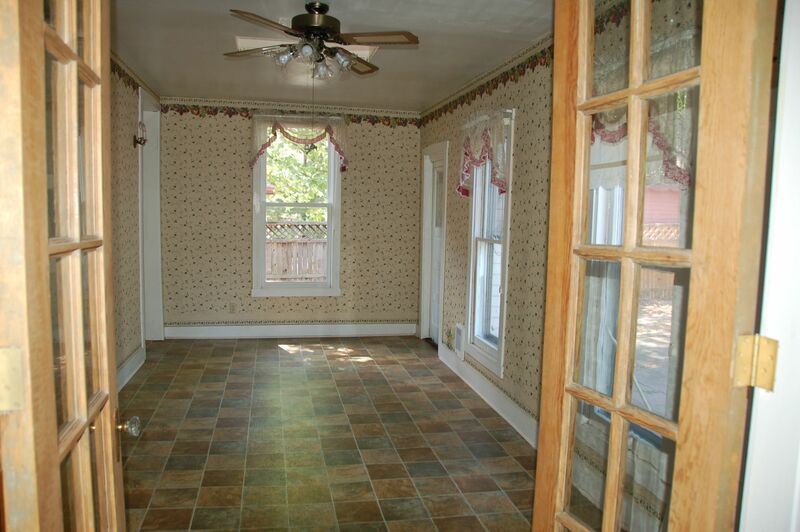 If we had a list of everything we wanted in a house, the only thing this is missing is a garage. But the basement with 8 foot ceilings works for a workshop (for now). 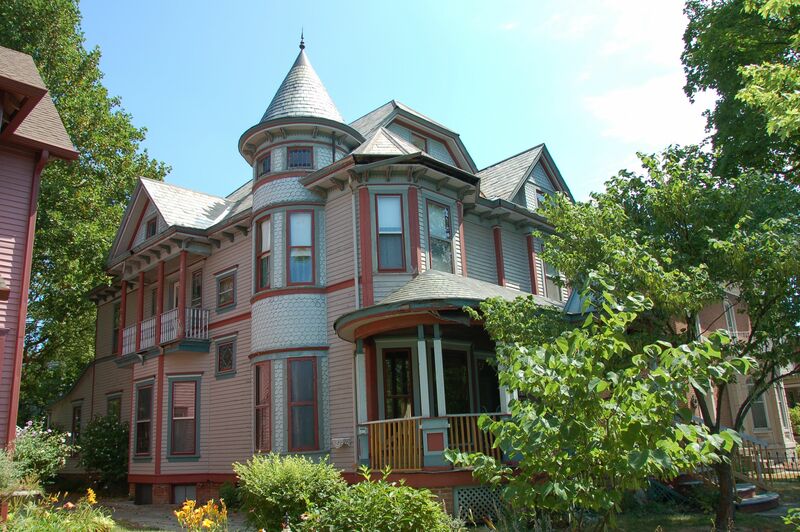 It has everything we ever wanted, including being in downtown Franklin (to walk to restaurants and the Artcraft movie theatre), and it has a turret and a balcony. Love at first sight. The more we went through it, and the more damage that we found, it broke our heart. This house needed passion, and a bit of crazy, to save it. No hesitation. We’re in. 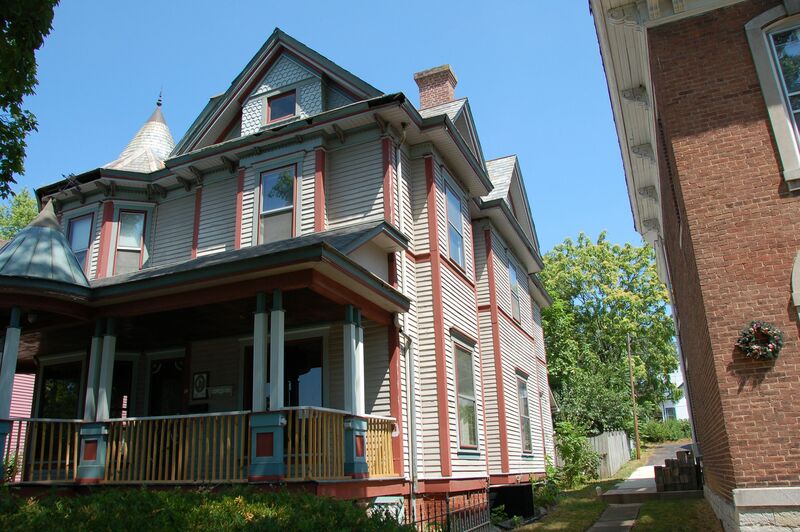 And with the help of a local bank, we were able to finance the house, plus enough to restore the exterior (except the porch, which we will be able to afford later), get a new slate roof, and gut the kitchen and install the kitchen of our dreams. 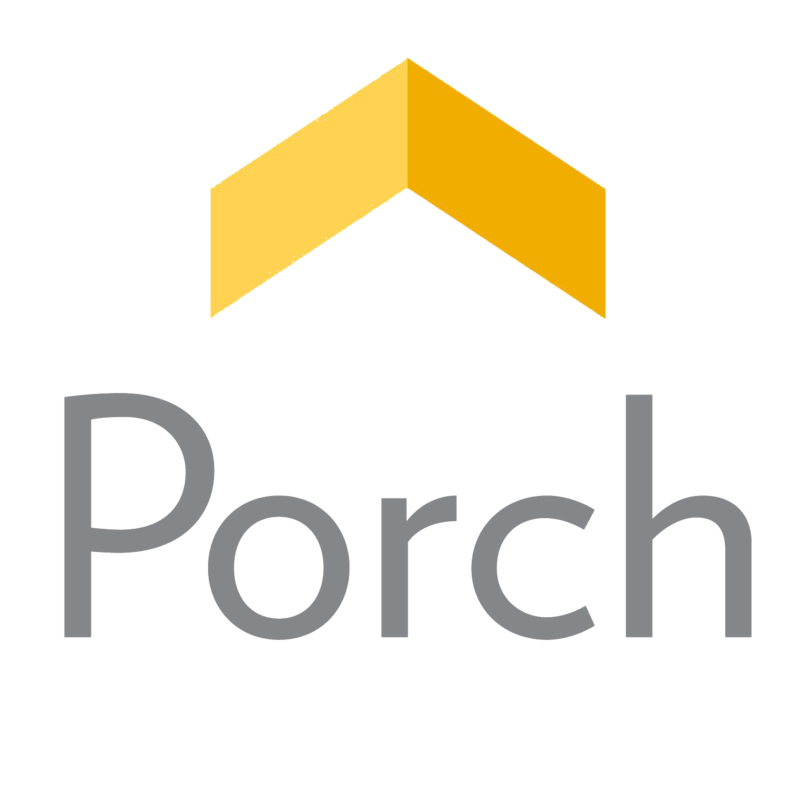 The loan allowed us to do some of the work ourselves (we did the majority of the kitchen, except moving walls and drywall…), which was great, because most loans require a contractor. We had to submit a DIY resume, proving that we had the skill and know-how to do it on our own. So the kitchen was ours, and we hired Scott Brown and the Brown Remodeling Company to do the exterior restoration. 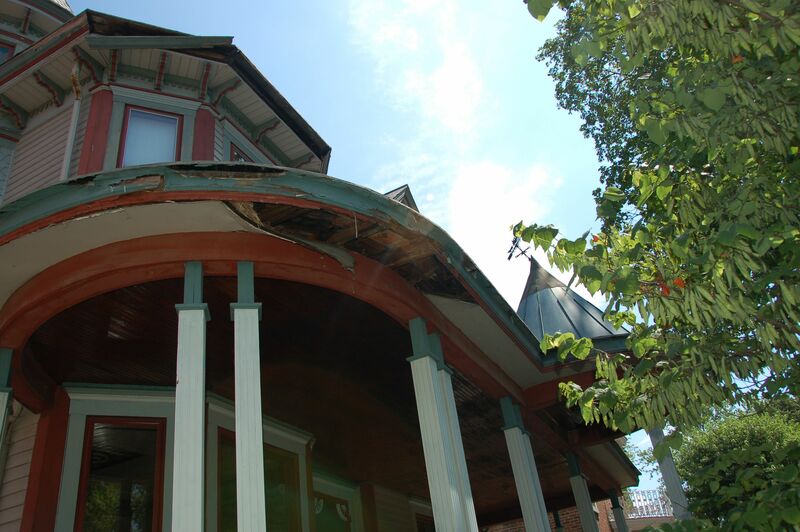 He and his crew focus exclusively on historic homes, and we couldn’t be happier with the team of people who came together to help us save this home. There’s the first glimpse of the adventure. I lived there for two years with the Beidlers. My bedroom was the one with the balcony. The one thing I remember the most was how cold it was in the winter. I slept with many blankets, a full set of clothes and I could see my breath. I just realized I never wrote back to this – I’m so sorry! We love that little room, but you’re right – it’s a struggle temperature wise! Ahhhh, that first flush of love!!!!!!!!! Hi, love your Blog! My son is looking at an old Vic, in many ways the floor plan looks very similar to your. Through time however, we think than a wall or two have been remove to give the first floor a more open feel. I would love to compare them! Would you share your floor plan with us? Here is a link to the home he is looking to purchase http://www.pilmerrealestate.com/reports.html I direct your attention to book case to the right of the stairs, could this be were the original hall was? Hi, Chuck! The link you sent takes me to a general page, and not a specific house. I would LOVE to see it! Can you send a direct link!